What is more refreshing on a hot summer day than Watermelon? Its sweet and juicy and so delicious! 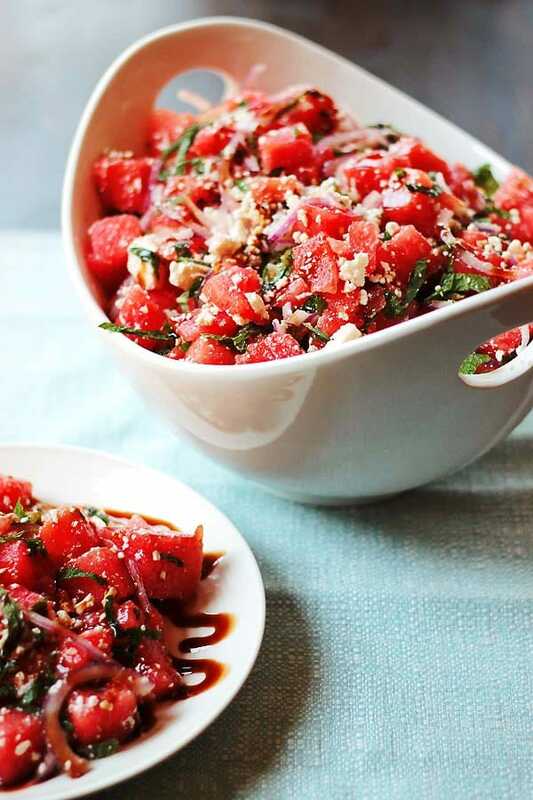 It’s a little messy and sticky if you aren’t careful, but that’s one reason this Watermelon Salad is so perfect. No mess (for the person eating it) as you have little bite sized watermelon pieces. Its also really really good! It’s a bit of an unusual combination, but the sweetness of the watermelon mixed with the saltiness of the feta, a little bite of onion all drizzled with tangy sweet balsamic reduction works like magic on your plate. Pick one that looks dull, shiny means that its not ripe yet. Watermelons develop a “field spot” where it rest on the ground in the field. This spot should be a creamy yellow color when its ripe. A ripe watermelon is a heavy watermelon. It should be round or uniformly shaped. A strangely shaped watermelon may not have got proper sunlight or water. When you tap it, it should sound hollow. 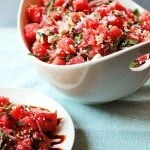 Everything about this Watermelon Salad screams FRESH! I think it has a lot to do with all the fresh basil and mint. 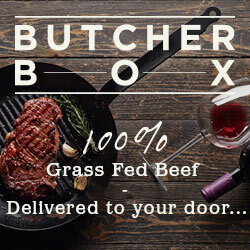 Just the smell of it is so amazing and I love how their fragrance fills your kitchen as you chop it up. There is hardly any dressing in this salad so the freshness and flavor of the ingredients really shine. This salad is can be really causal but can also be an extraordinary dish for company. If you were to dish out salad for your guests and then drizzle the balsamic reduction over each individual plate it would look beautiful and impressive! Cut your watermelon in bite size pieces. Add it to the bowl. Add sliced onions, basil,mint, and feta cheese to your bowl. Drizzle the olive oil to coat salad and toss. You can either drizzle the balsamic over the whole salad and toss it before you serve, or you can dish out the salad first and then drizzle the balsamic reduction over each plate. Either way will be yummy! Hi Valerie, I am just setting up our email list. I will add your email once I have it ready to go. Please add me to your mail list. I love the Watermelon Salad,it wonderful ! !